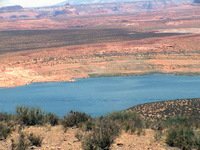 Lake Powell Water Level in July? Stunning! 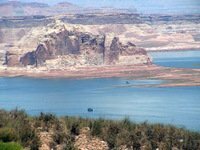 Wondering about the Lake Powell water level in summer? So were we as our road trip took us through southern Utah and northern Arizona in July 2006. It gets blazing hot in that region. Would there be any water left when we arrived? 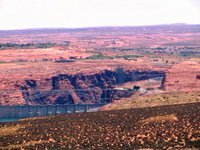 We soon found out - and discovered that Lake Powell would make a beautiful destination for a future vacation. Our next road trip desination? Approaching Lake Powell. It's a bit of a shock to see such a deep blue in the middle of the desert. 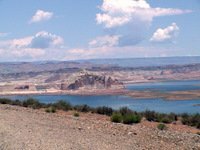 That's part of what makes Lake Powell worth a stop on your next road trip. I guess we weren't expecting Lake Powell to look so vivid. But the water is nearly an electric blue against the backdrop of drab desert colors. A wider swath of the lake. The water level looked pretty good, even in the height of summer. People were sailing and enjoying themselves. 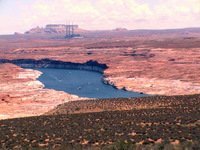 Where are the Lake Powell houseboats? But you know what? Although you're always hearing about Lake Powell houseboats, we really didn't see any. Was it just a fluke? Or do people stay away in summer? The average high temperature in July is 97. But I suppose it's a dry heat if you don't fall into the lake. It seems as if the desert heat would be quite relaxing, especially on the deck of a boat. We hope you've enjoyed these Lake Powell photos. We took many more. Stop by Lake Powell and take some of your own. Stay a while and rent a houseboat. I can hardly think of a more intriguing destination for a future road trip.